FastStone Photo Resizer is a portable image editing tool that can be used to easily convert and resize images. In addition it can also be used to rename, crop, rotate, change color depth, add text and watermarks to images all via the easy to use GUI applet or simple drag and drop operation. 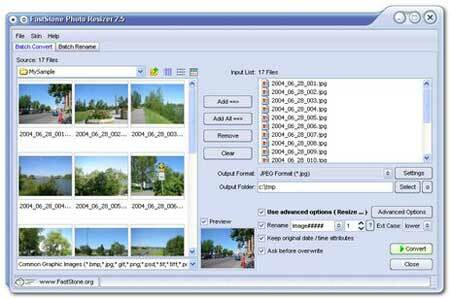 Edit single images or bulk edit in batch mode many images (resize multiple images) at once. The FastStone Photo Resizer requires 1.37MB of disk space for installation. If you deal with images, this is an essential tool to add to your portable USB flash drive collection.